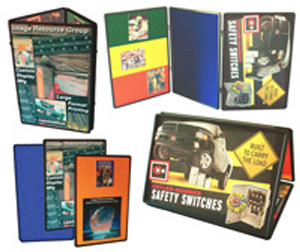 Gamma's panel display system & panel displays are new table top display items. 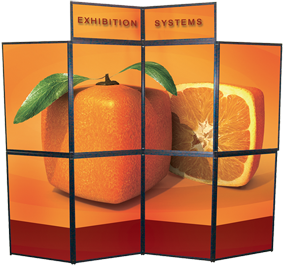 Gamma has added folding panel displays to our line of quality trade show display products because of their portability, sturdiness, and affordability. Our panel display system allows swapping out a single graphic without having to replace the other graphic panels. Each of our panel display systems takes only moments to set up. Simply unfold the panel display and use it! 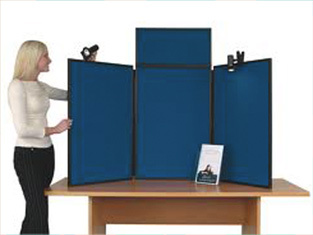 Panel displays are fabric covered in front and back and framed in black plastic. Headers and panel rows stack to attach vertically. • Shelves supporting 20 lbs. 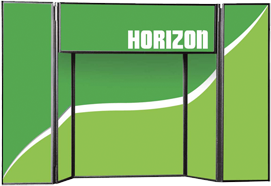 Panel Displays can be set up as a zig-zag display, triangular display, or floor standing A-Frame. The panels come off the hinges so that individual panels can be used as wall hangings when not used as a tabletop display. Panel displays are completely customizable, enabling the choice of graphics or accessory displays to be applied to the surface of the board; photos, charts, signs, or other visual aids are easily applied to the fabric panels by simply using velcro dots. Trade show graphics are printed on 22 mil PVC.